Listen. I am uttering two important sacred secrets. First, your body does not need the quantity of the food you take in. It is not just physical need. This is the first statement. 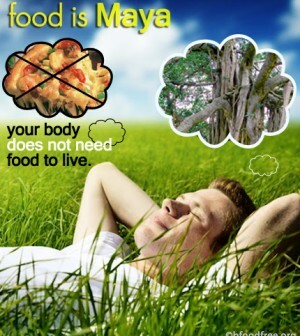 Second, your body does not even need food to live. Understand, first statement I am making – Your body does not need the amount of food you take in because the food is not just physical requirement. Most of the time, with the food pattern hundreds of other things are associated, hundreds and hundreds of other things are associated. 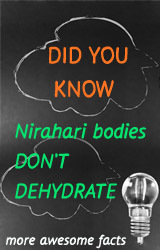 Actually to be successful in the Nirahari lifestyle, you have to complete with all the patterns related to food. 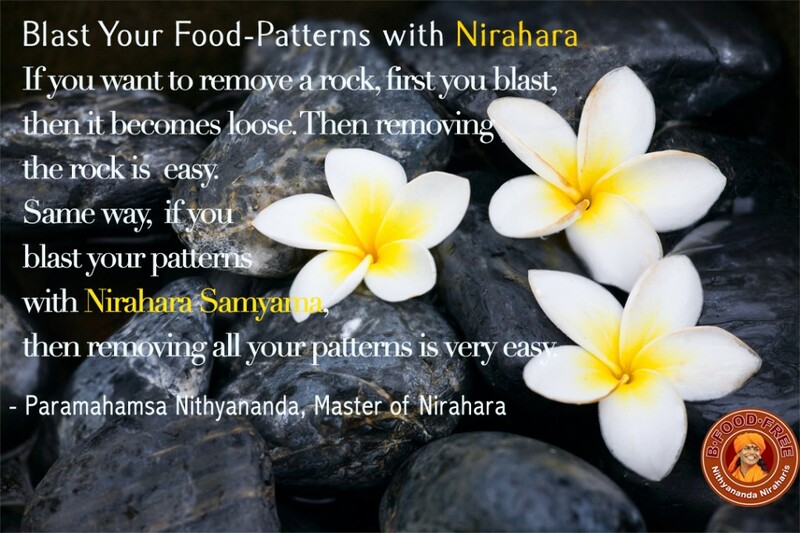 The first three levels of Nirahara Samyama – Level 1, Level 2, Level 3, you have to complete with all the root-patterns and patterns related to food. I Have Proved Medical Science is Wrong. Thousands of my disciples are living with simple juice, few living on water and air. Yes, I have proved Medical Science is wrong. I have thousands of my disciples living with simple juices, few living just on water and air. If you see them, you won’t find them very thin, skinny and all. They are good-size people. May not be obese, but good-size people. They look very healthy. I have proved with enough of scientific studies. I have proved enough, enough, enough. Now all you need to do, all you need to do, just listen, all you need to do is just try it once. Nirahara Samyama is not fasting, I wanted to make it clear. Usually, people fast to feast. When you start the fasting, you will be counting number of hours when you are going to end it and start feasting. Nirahara Samyama is not fasting. It is awakening, rekindling the power of your bio-memory to produce energy and food directly from air and water and space. Listen. It is to produce energy directly from the space. You need to understand, you need to live, you need to realize, only by living you will understand – the food is one of the powerful collective delusory pattern. ‘Collective Delusory Pattern’, that is what is the closest definition to Maya. Maya means what is not there, but shown- is Maya. Maya means the patterns which moves you away from your life’s mission, which does not let you go near your life’s mission. Maya is the name, but it does not define completely. 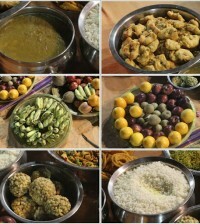 Food is one of the major ‘collective delusory pattern’ we human beings have created for ourself. 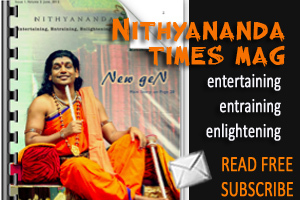 I tell you, if you do this Nirahara Samyama Kriya which I will be teaching on July 1st in the Nithya Satsang, your bio-memory will be awakened to produce the food directly from space. 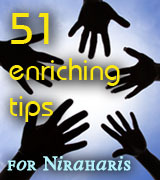 As I said, so many people got healed of so many diseases from this Kriya and through this Nirahara Samyama. Slowly, slowly, training your bio-memory to produce the energy directly from the space and liberating you from all the patterns you created about food and food itself – that is the purpose of Nirahara Samyama. And it is possible. It is possible. Your bio-memory, once awakened, will do so much good which you can’t imagine. I am not giving you false promises; I am just giving you possibility. 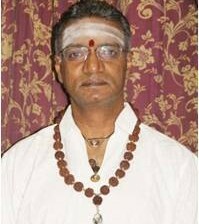 When you enter into the space of Nirahara, not only you go beyond food, suddenly your consciousness rises to the next level. Your consciousness rises to the next level; completely to the next level. 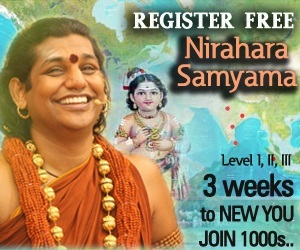 Nirahara Samyama will undoubtedly prove your own higher possibility for you. 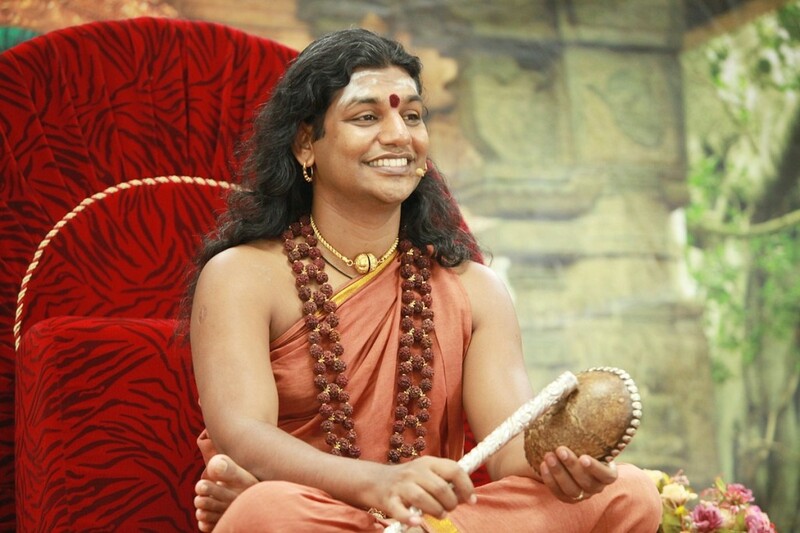 I tell you, if you want to practice Shraddha, Authenticity, gain confidence. First thing, hit at the root-pattern of food. Hit at the root-pattern of food. When you hit at the pattern of food, you will gain confidence about your Authenticity. You will gain confidence that you can be authentic, you can do something which others are afraid of doing, you can do something which even you are afraid of doing. 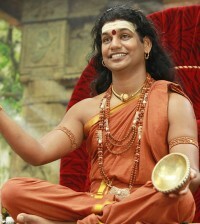 Nirahara Samyama is one of the most powerful technique, most powerful process. Understand, it is so unfortunate, human-beings have forgotten their capability so much, it takes so much to remember and bring them back to that space of remembrance of their capabilities. Nirahara Samyama will really, really, really help you to experience Authenticity, to live Authenticity, because it’s a direct experience which you can see directly, which you can listen directly, which you can visualize directly, the pattern with which you can directly play, complete. 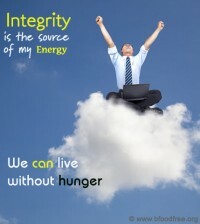 First thing required for Nirahara Samyama, start practicing Integrity, Authenticity, Responsibility and Enriching. Complete all the patterns related to food. I tell you, once you reach COMPLETION, you don’t need the quantity of food you are taking. With completion starts LIFE. Otherwise you are running out of compulsion. Either you run the life in compulsion, or completion. With completion, your life starts. With compulsion, not only you don’t have life, you constantly reduce the level of your life. Bring constantly Integrity to your thinking; Authenticity to your behavior; Responsibility to your actions; Enriching to your lifestyle. Nirahara Samyama not only liberates you from food, it liberates you lot of patterns you created based on food and many bondages related to food. See, if you want to remove a rock, first you blast, then it becomes loose. Then removing the rock is easy. Same way, all your patterns, if you blast that patterns with Nirahara Samyama, then removing all the patterns is very easy.